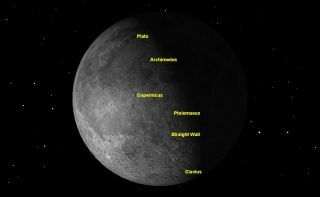 As the moon approaches last quarter on Sunday February 3, it is best viewed around sunrise. A lot of people lose track of the moon around this time of the lunar month. The full moon was shining bright just after sunset on Saturday (Jan. 26), but now the moon is nowhere to be seen in the early evening. The moon is still there of course, but it has moved on in its orbit into the morning sky. It rises around 9 p.m. (your local time) and shines the rest of the night. Each night it rises about 50 minutes later because of its orbital motion around the Earth. At sunrise it is in the south, and that is probably the best time to observe it. The moon looks strangely different in a telescope around last quarter. That's because the familiar features are being lit from the other side, by the setting sun instead of the rising sun. Learning the geography of the moon has double value. Not only do you learn the names of features on another object in space, but you also learn about the history of science, because the moon’s craters are named for the famous scientists of history. It can also teach you a bit about the politics of the 17th century Roman Catholic Church. These names were originally assigned by 17th century Jesuit astronomer Giambattista Riccioli. You can see where his political alliances lay by the fact that he gave the name "Galilaei" to a rather inconspicuous crater on the western limb of the moon. Ptolemaeus is a crater 95 miles (153 kilometers) across, and is named after the greatest astronomer of antiquity, Claudius Ptolemaeus. He lived during the second century A.D., and his book, the "Almagest," summarized all the knowledge of astronomy obtained by the ancient Greeks. Ptolemaeus still ranked high in the eyes of the Church. Even so, Riccioli gave equal prominence to Ptolemaeus' 16th century Polish rival, Nicolas Copernicus, placing his name on one of the most beautiful craters on the moon, 58 miles (93 km) in diameter, with a central peak and terraced walls. Look particularly at the plain to the east of Copernicus, which is littered with tiny craterlets. The perfect oval Plato crater marks the lunar Alps in the north. Named after the great 4th century Greek philosopher Plato, it is 63 miles (101 km) in diameter. Look for the Alpine Valley to the east of Plato; large telescopes will show a narrow rille meandering down its middle. Near the South Pole is Clavius, one of the largest craters on the moon, 140 miles (225 km) in diameter. How many craters and craterlets can you count inside it? This crater was named for Christopher Clavius, the 16th century German Jesuit astronomer and mathematician who designed the Gregorian calendar, which most of the world uses today. One feature which is strikingly different at last quarter is the Straight Wall or Rupus Rectis. This impressive cliff is 68 miles (110 km) long and up to 980 feet (300 meters) high. It casts a shadow at first quarter, making a dark line, but at last quarter its face is lit by the setting sun and appears instead as a bright white line. If you can manage to observe the moon several mornings in a row, you can watch as the sunset shadow moves across its face, until nothing remains but a narrow crescent. Editor's note: If you snap an amazing photo of the moon or any other night sky object, that you'd like to share for a possible story or image gallery, send photos, comments and your name and location to managing editor Tariq Malik at spacephotos@space.com.